Taking planning efficiency to the next level. Find out how project planning software helps you achieve better project results. Efficient project planning and scheduling is the key to successful project delivery. There are a multitude of project management software solutions in the market that help with the planning, scheduling, tracking and management of projects. Some project management solutions support project managers and teams only with part of the project related tasks and duties. Others provide are full-feature range that helps everyone involved with all the relevant project tasks. InLoox PM is a full-featured, yet easy-to-use project management software solution that supports you and your team in every step of the project planning and execution process. From the conceptualization over the planning and scheduling process to progress tracking and resource management, InLoox provides the right infomation at the right time to everyone involved. This helps you streamline not only the planning process but also the project execution and allows you to make the right decisions at the right time, ensuring successful project delivery on time. We compiled information on how InLoox PM solutions support you in every step of the project planning and scheduling. Every project goes through different phases and there are many things to accomplish before you and your team can delve into the completion of project related tasks. Having a good project plan is the basis for successful project delivery and for achieving the project goals in the required quality. A consisten project plan not only shows you what has to be done, it also shows task dependencies and includes important deadlines like project milestones. InLoox PM goes far beyond these basic project plan requirements and offers a comprehensive and consitent overview of all the project related information that influence the timely completion of your projects. Find out more about all the simple to use InLoox PM features that help you optimize your project plan. Before you set out to the actual planning it helps to have a good idea of the project's underlying concept and the different elements that are included in the project plan. The InLoox PM Mind Map feature allows you to visualize your project ideas, interlinking project elements like departments, teams, and tasks. Moreover, you can attach existing documents like project goals and requirements, preliminary team lists, etc. directly to the relevant Mind Map node. Thanks to the full Microsoft Outlook integration, all your e-mail communication is also immediately connected with the new project and important information for your project planning is no longer lost in the depths of your inbox. 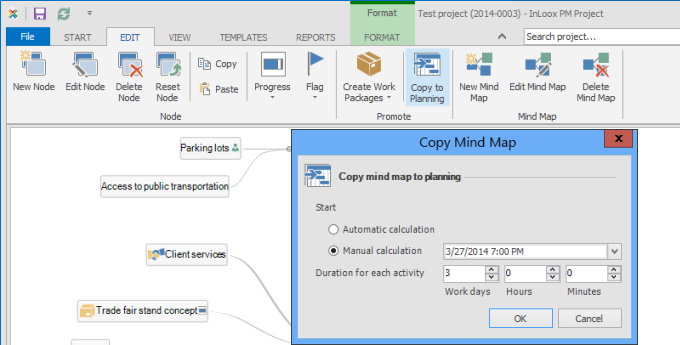 Once you've completed your project concept you can transfer the Mind Map to the planning feature. The software will automatically generate work packages that you can assign to project resources and turn Mind Map nodes to project activities and summary tasks in your Gantt project planner. The InLoox Gantt planner provides a graphical overview of the entire project schedule, including task dependencies and crucial deadlines like project milestones and planned workforce effort. You can track the progress of individual project tasks and work packages and monitor the overall project progress. 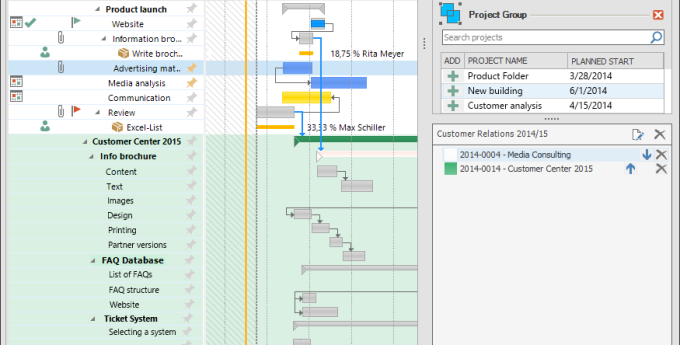 In order to increase overall transparency, you can custom highlight the individual progress bars in the Gantt planner to gain an even faster, complete overview. The software automatically highlights project plan elements that overrun deadlines, turning InLoox PM for Outlook into a great early warning system, that helps you make timely decisions to get back on track. Display the critical path to detect potential bottlenecks. Our Gantt planner also helps you make optimal use of your resource capacities: The Gantt chart features information on your team's relative workload and capacity utility. You can easily determine whether one or more of your team members are currently overloaded with work and re-assign work packages in order to even out the workload directly within the project plan. 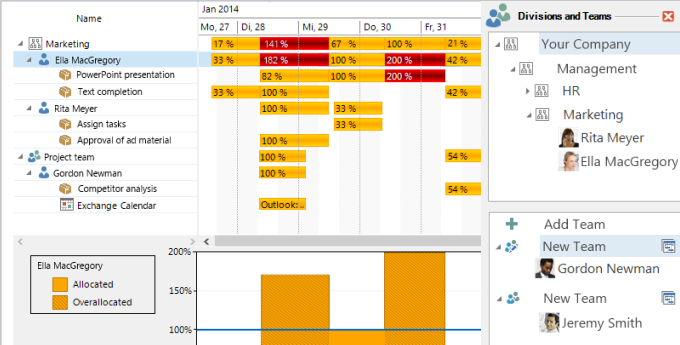 InLoox PM for Outlook is a fantastic project planning tool when it comes to multi-project management. If you have to manage very complex projects that you want to break down into smaller scope projects in order to improve their execution, InLoox helps you coordinate your overall management efforts. Simply interlink the various projects with the project group feature. You can see overall dependencies and resource capacities and everyone involved can access project relevant information and documents directly via the project schedule. No matter how complex a project is, every step of it can be broken down into the most simple entity: a task. InLoox PM for Outlook makes it easy to manage your and your team's tasks. 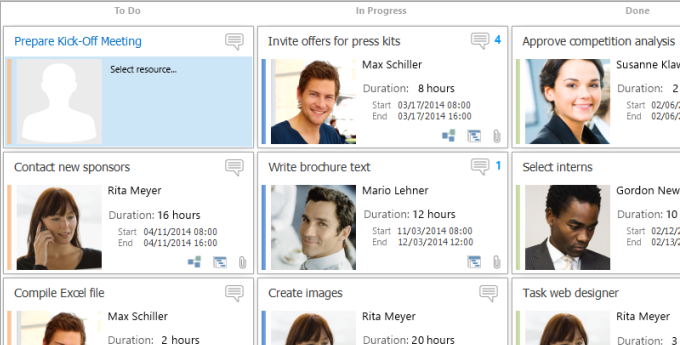 The latest version of InLoox PM for Outlook offers a Kanban module for your task management. 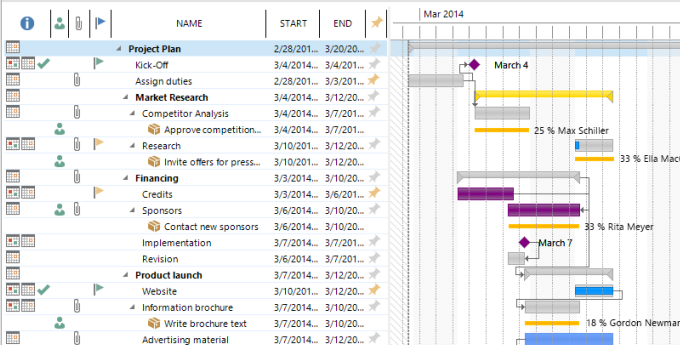 Create work packages independent of the project schedule or in context of the Gantt project planner. You can assign individual work packages to one or several team members, providing them with detailed information on the task at hand. The Kanban task management concept also perfectly fits agile project management methods. All unassigned tasks constitute the project backlog and your team members can pro-actively assign themselves to one of the tasks, switching the task status to "In Progress" and mark it as "Done" simply via Drag 'n' Drop. Instead of e-mailing back and forth, team members can leave work package related comments directly in InLoox PM, streamlining the project communication. This also facilitates a consistent feedback loop back to the project management. Every project is different and even the most experienced project manager greatly depends on the information that the projec team provides especially when it comes to maintaining the project schedule. Every project has only limited resources and making optimal use of the resources available is crucial for successful project delivery. With InLoox PM, you have a most up-to-date overview of the real-time resource utilization and available resources to optimize your project planning and project execution. Whether you need to manage construction materials, labor resources, or organize load factors, InLoox PM combines all the key data you need to avoid bottlenecks and resource overloads. A resource overview is integrated in the overall project plan, making it easy to track resource capacities and re-structuring their utilization as needed. The resource capacities are based on customizable working time calendars that reflect the weekly and overall working hours of individual team members. If you save the project controlling for last, you might very well have an unpleasant wake-up call when it is already too late to take any counter measures. With InLoox PM for Outlook you can track any project related costs and revenues while the project is underway. The software facilitates a continuous plan/actual comparison of all the costs you incur, providing you with greater budget transparency and giving you the chance to intervene in time if your budget threatens to blow the project scope. Instead of juggling several software programs, the InLoox PM project planning features cover the entire project time tracking process: Team members can record the work hours they spent on a specific task with the Stop Watch feature. They can immediately book the recorded work hours to the relevant project element and the software will automatically calculate the costs that incur from this resource utilization. 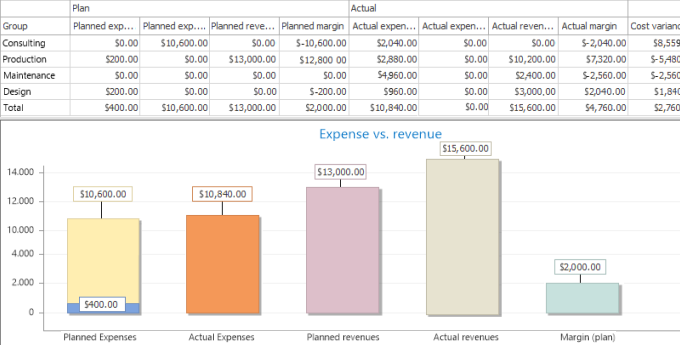 This both guarantees a continuous expenditure documentation and simplifies the final accounting. The graphic budget and cost overview makes it easy to monitor and track any project related development and helps take the right measures at the right time. InLoox PM project management software integrates perfectly with the Microsoft groupware Outlook. The software's interface seamlessly integrates into the familier Microsoft Outlook environment, making it very comfortable and easy to navigate the various project planning, scheduling and management features. Thanks to the integration into a software you already use the most every day, everyone on the team knows right from the start how to work with the software and this allows you and your team to be more productive from day one. The familiar software navigation and it's intuitive user interface increases the acceptance of the new tool among the project team members. Implementing the best project planning software is futile if the people on the team do not integrate the solution into their daily project tasks and workflow. The software combines all relevant project planning, scheduling and management tasks and this helps you avoid redundancy in your work organization. The software makes sure that your Outlook information like calendar entries and contact information are in sync with the information captured in the project planning application. Moreover, you can immediately use of all the Outlook specific content such as e-mail communication history in related projects. With the full Microsoft Outlook integration, all your project data is only a click away. InLoox PM for Outlook is based on the Microsoft technology and is therefore compatible with any program in the Microsoft Office Suite like Excel and Word. The software navigation is intuitive and easy because it is similar to the familiar Microsoft Office navigation. Instead of going through time and cost intensive training sessions, everyone on the team work productively from the get go. You can import files in all the common formats and export project information, for example for reporting purposes in a multitude of file formats. Discover the full feature range of our project planning software solutions with our free, 30-day trial version and find out for yourself, how InLoox PM helps you optimize your project planning and scheduling. Our software experts are happy to assist you in finding the solution that best fits your needs and will demonstrate all the powerful InLoox PM for Outlook features in a live web demo. 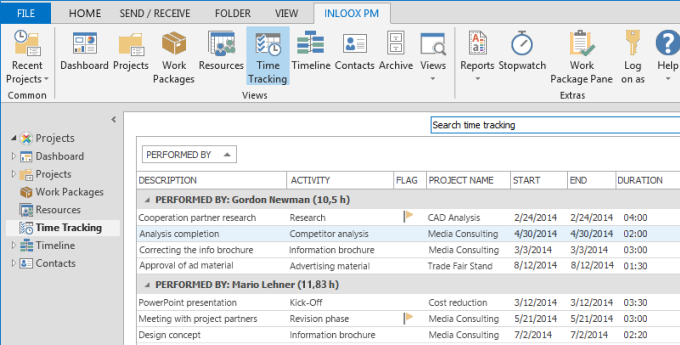 For more detailed information on the entire feature range of InLoox PM for Outlook project planning software go to the feature overview and comparison. Effective Project Planning with InLoox PM • Copyright 1999-2019 © InLoox, Inc. All rights reserved.